So you’ve got your campervan booked and sorted for your big drive holiday, what next? 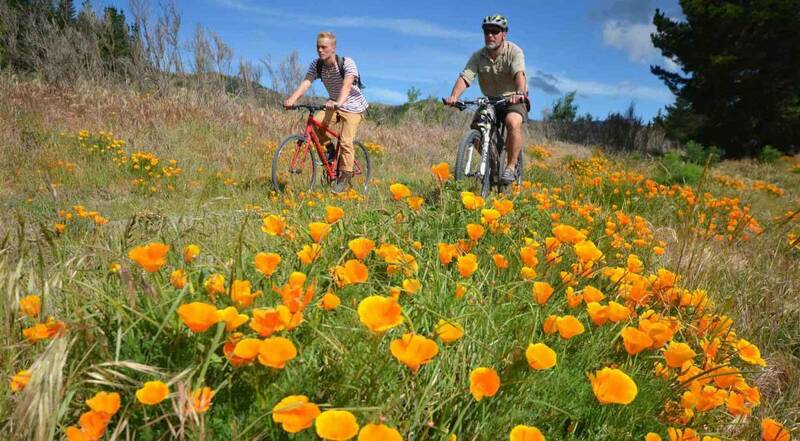 We recommend jumping on a bike and exploring some of the stunning New Zealand cycle trails. 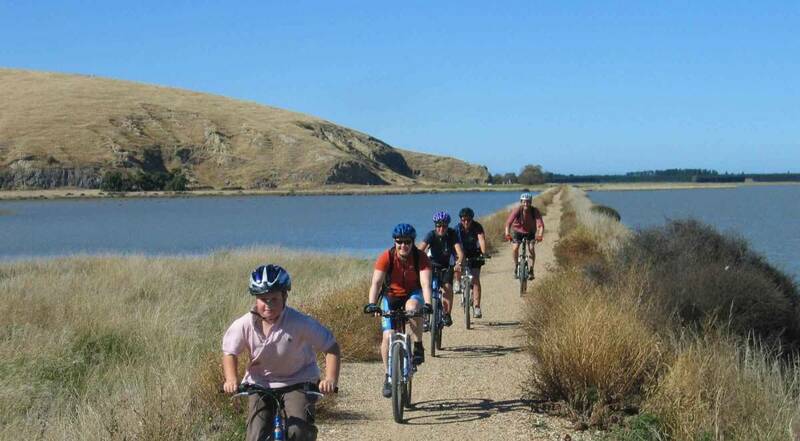 Immerse yourself while experiencing a New Zealand bike tour and cycle through areas you can only explore by bike. It really is one of the best ways to see the sights and deepen your experience of the countryside. But that doesn’t mean you can’t have the best of both worlds! It’s easy to hire a bicycle for short periods, such as getting to the local shops, exploring the town or just spending a couple of hours enjoying the breeze on your face and the road on your heels. 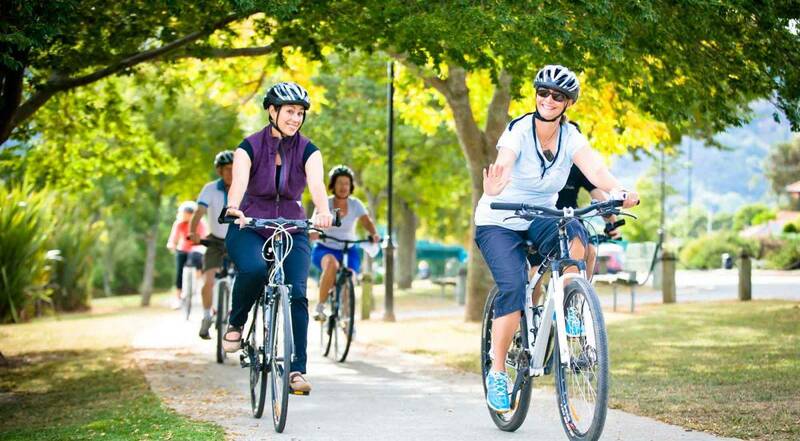 Alternatively, there are plenty of cycling tours throughout New Zealand you could book into along the way. Here are a select variety of easy trails you can do in just a few hours, brought to you by New Zealand Cycle Trail! An expansive promenade with dozen of design awards, which stands out as one of the most spectacular walkways in New Zealand, the New Plymouth Coastal Walkway is still one of our personal favourites. Journey from New Plymouth’s central shops, across the coast to the Taranaki Cycle Park. You’ll pass the interesting sculptures, views of the Tasman Sea, coffee carts, bike hires and a skating rink. Our favourite moment is crossing the Te Rewa Rewa Bridge, where you can see the volcanic Mount Taranaki, which last erupted in 1854. 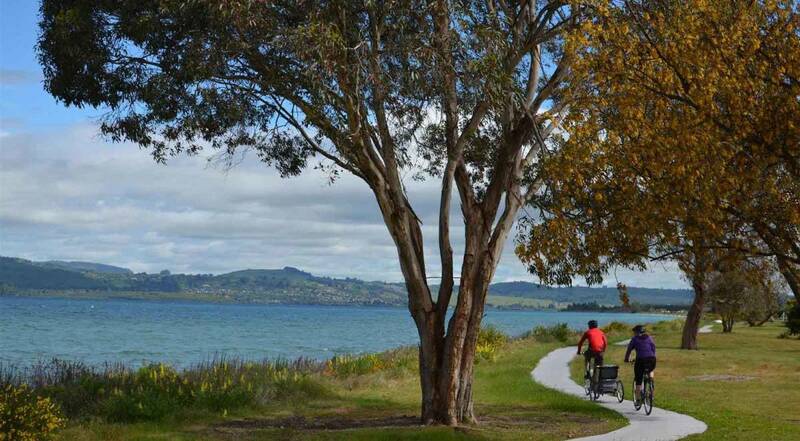 Begin your ride where Lake Taupo joins the Waikato River, and soak in the fantastic views of the great lake, cafés and picnic areas. From Ferry Road, you’ll pass lakefront parks, reserves and Hot Water Beach. 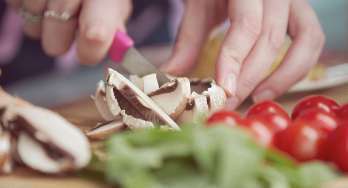 Cycle in a relaxing environment, and then have a go at the Hole in One golf challenge or lay on the greens for a relaxing barbecue picnic. 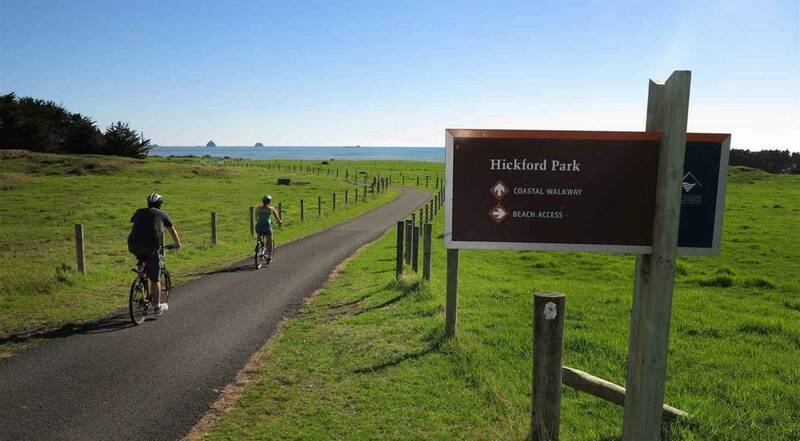 The rolling gravel path over the sand dunes between Opotiki and Tirohanga is perfect for cycling, with the surrounding views of the coast and mountains making it all worthwhile. Kick off from St John Street in Opotiki, cross the large Pakowhai ki Otutaopuku Bridge and follow the trail into the dunes. In the mood for a picnic? There are two great lookouts with tables and 360-degree views halfway through the ride. Once you reach the Tirohanga Beach Holiday Park, find the petrol station café for refreshments before you return the same way, or you can continue down the trail for another beautiful 3.3 km. Extra brownie points if you can spot White Island, New Zealand’s most active volcano, with its immense volcanic plume seen hanging above it. From the centre of Blenheim, you can take this gentle meandering trail up the scenic Taylor River, with several potential destinations, depending upon how long you’d like to ride for (the farthest being the Taylor Dam Reserve). You’ll pass Marlborough’s River Queen, a classic river steamer with café and bar, and the Taylor Dam Reserve, which has a small playground and picnic areas. Along the way you’ll find the Wither Hills Mountain Bike Park, which has several great trails for keen riders, so if you’d prefer the path less taken, that’d be the way to go. Sandy beaches, great cafés and brilliant mountain bike tracks. Kaiteriteri also has one of the most beautiful swimming beaches in New Zealand, so don’t miss out. From the centre of Motueka, head to Motueka Quay and then take the path signposted as the Great Taste Trail. 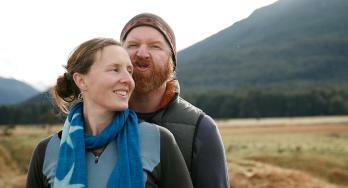 You’ll see the small town of Riwaka and its many tempting cafés, such as the Ginger Dynamite. 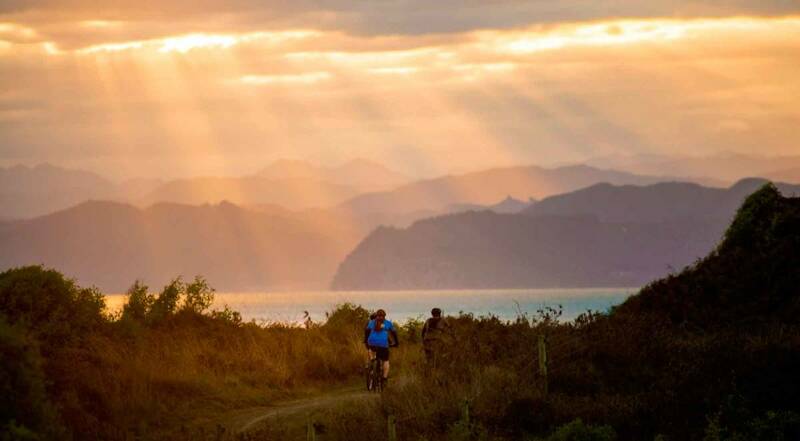 Continue on the Great Taste marker posts as they guide you through a reserve, orchard and the coast before entering Kaiteriteri Mountain Bike Park. Then it’s 3 km of fun with the Easy Rider track, which leads straight to the small holiday village, Kaiteriteri, where you’ll find a playground, general store, café, and the beach. A disused railway line is the perfect route for a cycling trail. Found between Christchurch and Banks Peninsula, it passes one of the most important bird habitats in the South Island. Beginning at the historic Motukarara Railway Station, you’ll pass Lake Ellesmere to the coast at Birdlings Flat. 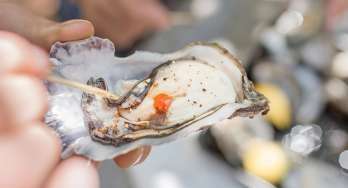 If you like, you can take a 1 km detour to experience the raw Pacific Coastline, or continue to the centre of Little River, an interesting village with a museum, gallery, café and more. Bird watchers shouldn’t forget their binoculars. Up to 150 bird species have been spotted in Lake Ellesmere / Te Waihora, so prepare for a visual feast. For more information on Britz bikes and bike racks click here and to find your next ride go to www.nzcycletrail.com.